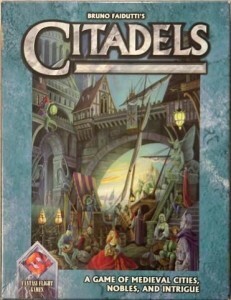 Citadels comes in a box that looks a little something like this. Image from Board Game Geek. Today I thought I’d take a break from talking about progress on Corporate America and instead focus on a very cool game by another designer, Citadels. Citadels isn’t a new game–in fact, it was released over a decade ago, in 2000–but it is an elegant and very fun game, and there’s a lot to learn from looking at what Bruno Faidutti, the game’s designer, did right. In case you haven’t had the pleasure of playing the game before, I’ll go over how it works before getting into the intricacies of the design. Citadels is a game for 2 to 7 players, already an impressive range. Each turn is composed of two parts. First, players draft roles. There are 8 roles in the base game, each with a different special power. The order of play in the second part of the turn is also determined by the roles. 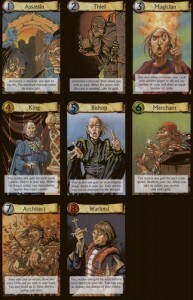 To draft, the current king gets a hand of role cards, chooses one, and passes the remaining cards to his or her left. Each player in turn picks a role until there is only a single role left, which no player will adopt for the turn. In the next part, players take their individual turns. Each player gets a chance to choose to draw building cards, used to build up their cities, or take gold, used to build buildings. The player then gets a chance to build one building. Additionally, the player’s role special power can be used at any time. Examples of special powers include the King, letting you go first on the next turn and giving you extra money for certain buildings in your city, or the Architect, who lets you draw extra building cards and construct extra buildings on your turn. Play continues until one player has eight or more buildings in his or her city, at which point players are awarded victory points based on their buildings, with a few bonus points thrown in. Whoever has the most points wins. That’s pretty much the whole game. It’s beautifully simple on the surface, but its elegance hides a great depth that gives the game a surprising amount of replayability. One of the things Citadels does best is focus on one very interesting mechanic, drafting roles. Everything else in the game is there to support that single focus. Nothing else in the game is more complex than it needs to be to make sure the central mechanic is interesting. The game is all about choosing roles. Image from Board Game Geek. In order to make the roles have some meaning, the players have to be working toward something, and in Citadels players are striving to build buildings in their cities. Buildings come in five colors, but four of those colors are simple, having a single rank which is the building’s cost in gold as well as its value in victory points at the end of the game. Buildings of the fifth color each have a special rule, but they are usually simple, such as being worth more victory points than the amount of gold they cost. Otherwise, the colors only matter because having at least one building in each color gives you extra points at the end of the game, and certain roles care about buildings of certain colors (a simple way to support the drafting mechanic). The building mechanism is simple enough that it doesn’t distract players from the game’s central mechanic, drafting roles, but it still motivates players effectively (and gives players who care a lot about building something something to build). Most of the complexity introduced in the buildings even supports the roles, since different colored buildings encourage players to go for specific roles. Other than drafting and building buildings, there really isn’t much to the game, because there doesn’t need to be. Note that there could be all sorts of crazy extra parts, but they would only serve to dilute the game. I keep going on about how great the drafting mechanic is, but what exactly makes it so good? Actually, there are a lot of things! However, I want to point out two roles in particular that I think really make the game work: the Assassin and the Thief. These are the first two roles, so the player who chooses the Assassin goes first for the turn and the Thief goes second. But the special powers for these roles work similarly. In the case of the Assassin, the player chooses a role to kill (note, you don’t choose a player, you choose a role, like King). If a player happens to have that role, he or she loses her turn. The Thief also chooses a role, but instead of losing a turn, the player who has that role must give all of his or her gold to the Thief at the start of his or her turn. The first thing that makes these roles work so well is imperfect information. When drafting, you know your role, and depending on pick order you know some of the roles other players might choose, but you don’t know which player chose what. You might have an inkling based on the amount of gold and building cards a player has in hand, as well as which buildings the player has in play, but you can’t be sure. In fact, there is a ton of room for excellent mind games here. If you choose the Assassin or the Thief, you will often want to target a player, but you will have to guess which role that player has. You might choose the obvious choice for that player (say Merchant if the player has many building cards in hand but little gold to buy buildings with). But the player might know he or she is a target, so instead hide in a less obvious role, such as the Bishop. Knowing the people you’re playing with gives you a big advantage, since you then have a better idea of what their strategies will be. I have often talked about how important it is to avoid letting players directly attack each other in games, especially games with lots of players. While the Warlord role can directly attack another player (at a significant cost), the Assassin and Thief roles elegantly prevent players from directly attacking each other by targeting roles rather than players. With careful observation and a little luck, there’s a good chance you’ll hit the player you want, but you never know. Preventing players from directly attacking each other helps the game by preventing players from feeling bad for getting beat up by the other players. If you get hit by the Assassin, who knows if that player was going for you, or just happened to choose your role? Many players also feel more comfortable being the bad guy when they don’t have to directly attack their friends (though not everyone; see: me). If you choose to kill the King, who knows who the King is! In Citadels, different roles have different powers, and they are not created equal. In particular, the Merchant, Architect, and King are all quite powerful, helping to restock gold, building cards, and giving an advantage for choosing roles in future turns. Other roles, such as the Warlord, Bishop, and Magician, offer bonuses, but much smaller bonuses. Finally, the Assassin and Thief offer no immediate rewards and are therefore the weakest powers. That said, the different roles are nicely balanced by the Assassin and Thief’s powers. The Assassin goes first and is therefore immune to either power, and the Thief is unlikely to be targeted by the Assassin. On the other hand, the roles with powerful abilities are also big targets, making them high risk/high reward options. The mid-tier roles are useful in their own way, offering a small boost while also providing some protection against the attacking roles since they are less splashy than the powerful roles. The roles having different power levels but balancing out in other ways is great design. It ensures that all roles have a place in the game, and that strategically picking one is challenging and ever evolving as the game progresses. Having the players control which roles are hit each turn is an excellent way to introduce randomness elegantly, so most players don’t even see it as randomness. If you’re looking for a quick game that can handle a wide range of players, I highly recommend Citadels. It is deep enough for the most strategically minded players but quick and social enough for more casual players. If you’re looking to improve your game design skills, I once again highly recommend Citadels. 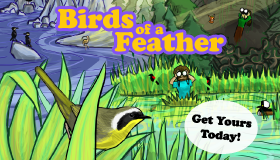 It packs quite the punch in a small package, something you should strive to do in your own games. It handles many common problems games face in elegant and interesting ways. But perhaps most important, Bruno focuses on one simple, interesting mechanic in a way few designers have the discipline to do.